F&F sent me the cutest little care package and came at the perfect time, it's like a "I'm here to look after you instead of your boyfriend while he's away on holiday" box which arrived the night before Andrew left for America for 3 weeks. It came all wrapped up like a big present and contained a onesie, slippers and ear muffs to keep me warm, the new Bridget jones book to keep me entertained and a decorate your own gingerbread man kit - you guys know me and my sweet tooth! Tell us your favourite part about your new F&F onesie? The first thing I noticed when I took it out of the box was how soft it was to touch, I couldn't wait to put it on! I love that it's not a crazy OTT onesie, I've tried them on before and it just wasn't me which is why I've never bough one before. This one is a lot more fitted with a subtle design and pastel colours. Where is the funniest place you've caught someone wearing a onesie? Last year when I was down in Canterbury Visiting Andrew at uni, one morning we were having a look around the cute little town center and we came across a girl in a giraffe onesie buying a sausage roll in Gregg's, it was very bizarre. Also last week I saw a teenager on the central line going somewhere with both her parents dressed in a Pikatu onesie hahah. If you could describe your perfect onesie in 3 words, what would it be like? There is nothing more than this one that I want from a onesie! Warm, comfy and cute. This Christmas if you were to give someone a onesie, who would it be? I think that it would only be fair to get it for my oldest, younger brother. My youngest younger brother has had his onesie for a few months and now that I have one too, it's about time he gets in on the act. Now that you own a onesie, will you be encouraging friends and family to get one too? What makes your perfect night in? I did a post about my perfect girls night in last week but for me, as long as I have my boyfriend (preferable at his house because mine is crazy all day and all night) and snuggly bed, which I will now be wearing my new onesie in, some yummy food (same as the girls night haha), a good nights tv/ chick flick and knowing that I don't have to get up early the next day is my perfect night! I can't wait for Andrew to get back so we can have one soon. 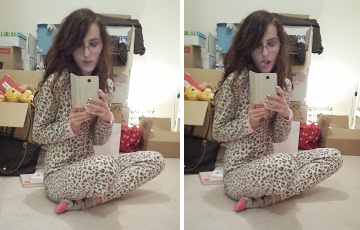 I'd love to know What Your Onesie Confession is? That's adorable!! Really great time, it's like they must have known? !